Loggerhead sea turtles always return to the same beach where they were born to lay their own eggs, and Folly Beach is a favorite nesting ground. The nesting season will begin next month, so here is some information about the turtles who return to Folly so often. Loggerhead sea turtles (Caretta caretta) are known to nest in Georgia, South Carolina, and North Carolina, but theyre not to be confused with the more southern species in Florida. The sea turtles that visit Folly have much lower population numbers than their southern counterparts. Typically the turtles are 3 feet long and can weigh up to 300 pounds. Female turtles crawl onto the beach in the night and dig in the sand with their back flippers. They then lay over 100 eggs into the hole before covering it back up and retreating back into the water. Mother turtles dont return to see their babies hatch. It takes between 45 and 65 days for the eggs to hatch, and then tiny turtles come out at night when temperatures are cooler and theres less chance of the turtles being harmed by predators. Hatchlings follow the light of the moon down the beach and to the ocean where they have to swim to the Gulf Stream to find protection and plenty of food. Loggerhead sea turtles face many dangers as babies, such as heat, artifical lights, ants, ghost crabs, dogs, birds, fish and people. 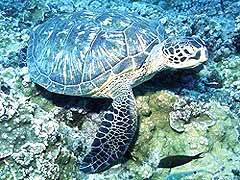 But even grown sea turtles arent safe, as boats, fishing nets, sharks, pollution, and people threaten them. For more information or if you want to help, visit follyturtles.com. My wife and I visit our favorite hotels North Myrtle Beach SC locations every year but mostly out of habit. It looks like we could have a great time if we checked out Folly Beach instead. My wife will love hearing about these loggerheads! Looks like a change in plans for our June vacation is in order!